In December 2017, a county water audit estimated 57 percent of 460 piped schemes and 45 percent of 687 handpumps were fully operational. Despite significant progress in building over 3,000 waterpoints across Kitui County in recent years, the challenge of providing sustainable drinking water services remains high. Reflecting this challenge, Kitui County Government has identified ‘Water and Food’ as one of its five strategic pillars. 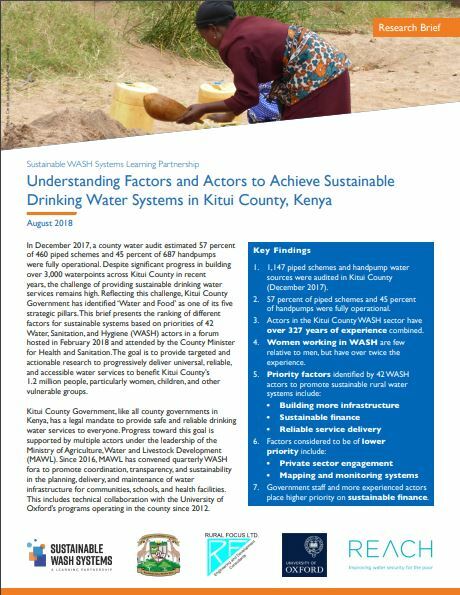 This brief presents the ranking of different factors for sustainable systems based on priorities of 42 Water, Sanitation, and Hygiene (WASH) actors in a forum hosted in February 2018 and attended by the County Minister for Health and Sanitation. The goal is to provide targeted and actionable research to progressively deliver universal, reliable, and accessible water services to benefit Kitui County’s 1.2 million people, particularly women, children, and other vulnerable groups. This research is part of the Sustainable WASH Systems (SWS) Learning Partnership, funded by USAID, in collaboration with the University of Oxford led REACH Programme, funded by DFID.